Abuja, Nigeria. January 21st, 2014 - Latest weekly poll results released by NOIPolls Limited have revealed that about 2 in 10 Nigerians (24%) may have directly or indirectly been victims of quack or sub-standard medical practitioners. The poll also identified Typhoid and Malaria Fever as the most prevalent ailments for which majority of the patients (50%) have been treated for by sub-standard medical practitioners, followed by pregnancy and childbirth (11%). Furthermore, respondents were of the opinion that the health condition of victims became worse after treatment. These were the key findings from the Sub-standard or Quack Medical Practitioners in Nigeria Snap Poll conducted in the week of January 13th 2014. Recent media reports in Nigeria have observed an upsurge in the prevalence of sub-standard or quack medical practitioners, with attendant effects on the physical wellbeing of the populace and life expectancy of the average Nigerian. In 2013 alone, there were several reports of arrests made by the Nigerian Police Force in various states, especially in Lagos state. For instance, the Rivers State chapter of the Nigerian Medical Association (NMA) had the police arrest 12 quack medical doctors and also had illegal hospitals in the state shut down. Similarly, several hospitals in Lagos have been closed down for practicing without medical licenses. Other cases include that of Gabriel Onyema and Stephen Nwankwo, who were arrested for causing the deaths of a number of pregnant women, while performing illegal surgical procedures in Lagos. Despite annual budgetary allocations to the health sector by various levels of government, the sector still grapples with several challenges: poor funding of the health sector; quality of graduates emanating from medical schools; deplorable conditions of health facilities & infrastructure; and poor remuneration and emoluments for medical workers, all these resulting in incessant strikes and labour actions, giving rise to the illegal practice of medicine in the country by individuals. In the light of these, NOIPolls conducted its latest poll on the prevalence of sub-standard/quack medical practitioners in Nigeria; in order to gauge the perception of Nigerians regarding their knowledge of the existence of quack medical practitioners and effects on the country’s health sector. Respondents to the poll were asked five specific questions. Firstly, in order to establish the awareness of the prevalence of sub-standard and quack medical practitioners in Nigeria, respondents who had an understanding of quackery were asked: Are you aware of the growing prevalence of sub-standard or quack medical practitioners in Nigeria? Overall, majority (79%) of the respondents answered positively to being aware of the growing prevalence of sub-standard or medical practitioners in Nigerian, while 21% of Nigerians responded negatively. 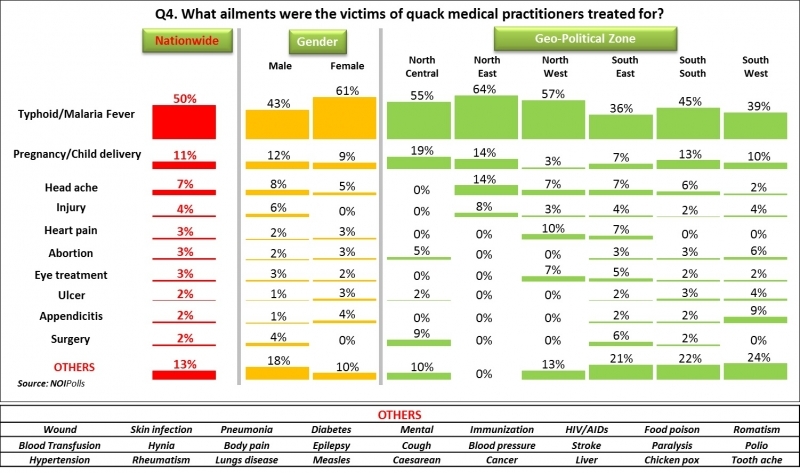 Further analysis, by geo-political zones, indicates that the North-West zone (92%) had the highest proportions of respondents that showed an awareness of the rising prevalence of quack medical practitioners, followed by the North-East zone with 88% and the South-West zone with 83%. Furthermore, in order to gauge the understanding of Nigerians regarding who really is a sub-standard or quack medical practitioner, respondents were asked: Who is a sub-standard or quack medical practitioner? Findings revealed that Nigerians have various perceptions on the concept of Quackery, giving a variety of definitions on who is a sub-standard or quack medical practitioner. Majority (44%) of the respondents, have an understanding that sub-standard or quack medical practitioners are “practitioners with incomplete qualifications”; while 35% of respondents believe they are “individuals that pretend to have medical knowledge”’. Furthermore, 8% say they are ‘individuals that use unproven and unscientific remedies’; 2% say they are ‘student practitioners’; and another 2% say they are ‘Native Doctors’. However, about 8% of those polled do not have a definitive idea about quack medical practitioners. Analysis based on geo-political zones revealed that the North-Central zone (52%) had the highest proportion of Nigerians who define quackery as “practitioners with incomplete qualifications”, while the South-West zone (45%) accounted for the largest proportion of Nigerians (45%) that believe quack medical practitioners are “individuals that pretend to have medical knowledge”. Subsequently, respondents were asked: Have you or do you know anyone who has been treated by a sub-standard or quack practitioner in Nigeria? Responses to this question revealed that 2 in 10 Nigerians (24%) may have been a victim or know someone who have been a victim of sub-standard or quack medical practitioners. However, the majority of respondents76% have not had any personal experience with quack medical practitioners. It is pertinent to note that these figures represent the perceptions of Nigerians based on their definitions of quack medical practitioners, and not based on professional assessment of quackery in the health sector. From the geo-political zone standpoint, the North-East zone (33%) accounted for the highest proportion of Nigerians that said they have been treated by quack medical practitioners, either personally or through relatives and acquaintances followed by the South East (28%) and then the South West (26%). The fourth question sought to know the ailment for which patients have been treated for by these sub-standard or quack medical practitioners: Respondents who claimed to have been treated/know someone who has been treated by sub-standard or quack medical practitioners (24% of the total) were asked: What ailments were the victims of quack medical practitioners treated for? Majority (50% of the 24%) were treated for typhoid/malaria fever, followed by 11% of respondents who were treated for pregnancy/child delivery care cases and7% who were treated for headaches. In addition 4% were offered treatment for injuries; while3% each were treated for heart pain, abortion and eye treatment. Furthermore, 13% of respondents (of the 24%) were treated for various ailments such as: Skin infections, Diabetes, Food poisoning, Epilepsy, Pneumonia, Toothache and Chicken pox amongst others. In general, this finding demonstrates that Malaria and Typhoid fever remain the most prevalent ailments in Nigeria. It is also alarming to observe that pregnant women and nursing mothers are exposed to the scourge of sub-standard and quack medical practitioners. Further analysis based on geo-political zones showed that the North-East zone (64%)accounted for the highest proportion of respondents who were treated for “typhoid/malaria fever”, while the North-Central zone had the highest proportion of respondents that received “pregnancy/ child delivery care” from sub-standard or quack medical practitioners. Findings based on geo-political zones show that North-East, South-East and South-West zones with 62% each accounted for have the highest proportions of Nigerians who claim that patient’s treated by quack medical practitioners “became worse” afterwards. In conclusion, the poll has revealed that that about 2 in 10 Nigerians (24%) may have been victims of quack or sub-standard medical practitioners; while Typhoid and Malaria Fever were identified as the most prevalent ailments for which patients fall victims of sub-standard or quack medical practitioners. Sadly the experiences of victims mostly end up in bitter tales as majority of respondents admitted that the health conditions of victims become worse after treatments by quack medical practitioners. However, it is imperative to note that these sub-standard or quack medical practitioners, criminal as they may seem, tend to be filling a critical vacuum necessitated by inefficiencies of the country’s health sector; particularly for the D & E socio-economic class (SEC) and income groups, who become victims of the incessant strike actions in public hospitals and can neither afford the cost of health care in private hospitals. Finally, the increasing prevalence of quack medical practitioners and cases of their victims are issues of grave concern, requiring urgent attention from all relevant stakeholders.